The traffic in Hanoi is one of the most incredible things I have ever seen. You will notice a fascination with motorbikes across much of Asia, but Hanoi takes it to the next level. Traffic moves without rhyme or reason, the bikes even venturing up onto the walkway at times. The cross-walks dotted across the city are laughable, anyone expecting the traffic to stop here is in for a surprise! In the crowded parts of the city, hundreds of motorbikes will fill the streets. The way to cross the street here is to slowly walk in front of traffic. The sea of motorbikes will begin to part and flow around you, like a river around a rock. 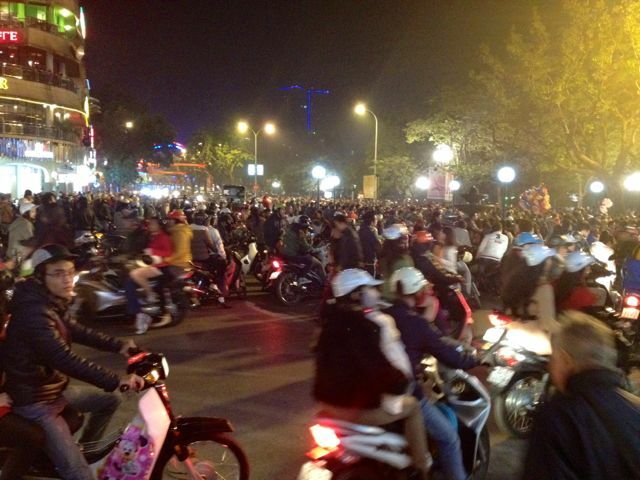 We were in Hanoi on Christmas Eve, when every person in the city seemed to be out on their motorbikes. Getting around was truly an experience!